mm-Wave Silicon Technology: 60GHz and Beyond covers silicon-based millimeter wave circuits and systems. It provides in depth coverage of advanced silicon processing technologies including CMOS and SiGe as well as modeling of active and passive devices on silicon at millimeter waves. It also provides coverage of mm-wave circuit building blocks such as low noise amplifiers, mixers, voltage controlled oscillators, frequency dividers, and power amplifiers that are suitable for integration in silicon. 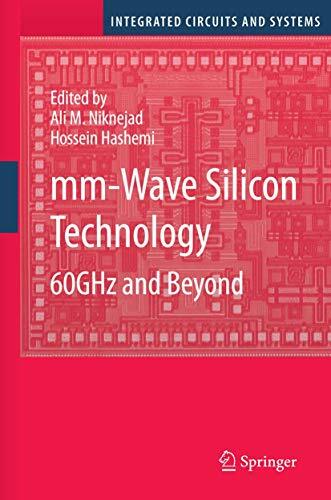 The book contains information on highly integrated mm-wave transceiver architectures with several silicon-based case studies. The book also includes advanced topics such as antenna arrays and beam-forming on silicon. The book begins by presenting the fundamental technology scaling and device-level changes that have allowed mm-wave silicon performance. It then covers critical front-end mm-wave building blocks that achieve high gain, low noise, high power, and good dynamic range in low voltage silicon technology. The book culminates in the discussion of phased-array systems capable of beam forming and exploiting spatial diversity for increased throughput or range. mm-Wave Silicon Technology: 60GHz and Beyond is written for practicing RF and analog circuit designers who are interested in this growing field. The chapters are self-contained and include short tutorials on important concepts before delving into details.